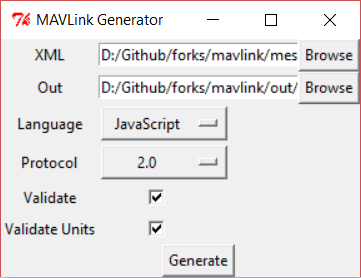 Language-specific MAVLink libraries can be created from XML Message Definitions using code generator tools. The available code generators and supported output languages for each version of the MAVLink protocol are listed in Supported Languages (these include C, C#, Java, Python etc). This topic shows how to use the two code generators provided with the MAVLink project: mavgenerate (GUI) and mavgen (command line) (other code generators are documented by their associated projects). You must already have Installed MAVLink (including both the tools below and XML Message Definitions). If you are generating messages for a custom dialect, copy the file(s) into the directory message_definitions/v1.0/. mavgen can handle dialects that have relative paths for included XML files (e.g typically common.xml), but other generators may not. We recommend putting custom dialects in the same folder as the ones that come with the mavlink/mavlink repository. mavgenerate.py is GUI code generator for MAVLink, written in Python. Mavgenerate provides a GUI front end to the mavgen command line code generator, and supports the same options. mavgen.py is a command-line tool for generating MAVLink libraries for different programming languages. After the mavlink directory has been added to the PYTHONPATH, it can be run by executing from the command line. This is the backend used by mavgenerate. The documentation below explains all the options for both tools. For example, to generate MAVLink 2 C libraries for a dialect named your_custom_dialect.xml. The syntax for for generating Python modules is the same, except that the --output specifies a filename rather than a directory.